Imperfectly Painted: Lemming Lacquer Curiouser & Curiouser! Lemming Lacquer Curiouser & Curiouser! I think I've mentioned a few times I'm a big Alice in Wonderland fan. I'm not so much of a fan of the Disney version as I am the book and the 1985 TV movie version even though it scared the crap out of me when I was a child (see below). When I see Alice in Wonderland collection I'm a sucker for them. Naturally, Lemming Lacquer's Curiosities of Wonderland collection caught my eye, especially this one. Curiouser & Curiouser! 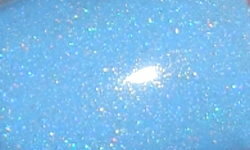 is a sky blue holo with a subtle dusting of gold shimmer. Color: This is a beautifully pigmented sky blue holo. This color is rich and soft at the same time. I love the opacity of this pastel blue. It's creamy, not chalky, and perfectly perfect! The holo is effect is light to moderate which is perfect for this type of color. I love the subtle golden shimmer, which was hard to pick up on camera. Formula: Excellent formula. This being a holo and a pastel one at that it was impeccable. I only needed 2 coats. It was smooth and so easy to apply. Price: This is $12 and available on Lemming Lacquer's website. Overall: I'm very impressed and in love with Curiouser & Curiouser! It's one thing to have a beautiful nail polish color, but to have a superior formula on top makes this one extra special. I have no complaints and love this beauty! Back to the whole scare the crap out of me bit...Did anyone else see this version of Alice in Wonderland that was made for TV? I absolutely love it and love all the songs from it, but I rarely find anyone who has seen it or remembers it! It was hard for me to forget because the Jabberwocky scene scared me to death as a kid! Anyone remember this? China Glaze Wood Ya Wanna?